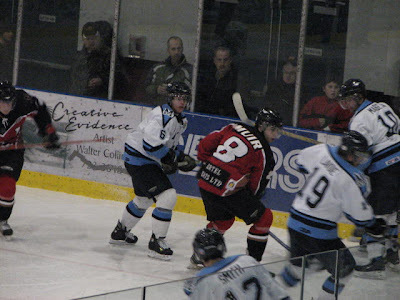 Dogs host Caps to round out '07, Provincal Curling in Port Alberni, and more. First things first. Click the image to enlarge. Should be a great one tonight as the Dogs go for 2 in a row and the Caps look for their 6th in a row. Don't forget, the first 900 fans in the doors tonight get CHEER STICKS. Also, anyone 21 and over is eligible to enter a draw for a trip for two to Las Vegas!! Canada has won the Spengler Cup! Congrats to the team and to Curtis Joseph, one of my favorite tendies of all time. I hope someone in the NHL gives him a shot now. DAVOS, Switzerland -- Canada has won the Spengler Cup. Kirby Law and Ryan Keller scored in the second period to lift Canada to a 2-1 victory over Russian club Salavat Yulaev Ufa in the final of the five-team tournament on Monday morning. Curtis Joseph was a standout in goal, allowing only Alexander Perezhogin's second-period tally for Ufa. It was Canada's 11th Spengler Cup win since it began entering teams in 1984, but its first since 2003. Canada used two breaks in the middle period to score. Russian goaltender Alexander Eremenko had Simon Gamache's wrap-around attempt trapped against the goalpost before Law whacked at the puck and managed to get it over the line. The goal stood up to video review, with the Russians arguing there should have been a whistle. A Canadian turnover at the Ufa blueline let Perezhogin streak down and beat Joseph with a quick off-wing shot in the 10th minute. But only a minute later, Keller scored for Canada. Port Alberni kicks off 2008 as the host city for the BC Junior Men's and Women's Provincial Curling Championships, with action starting New Year's Day and going all the way through the week until the semis and finals on Sunday. Here's the schedule. Thanks to Stefanie Weber for keeping me in the loop. Tickets are $2 per game, $5 for a day pass and $20 for an event pass. All tickets are available at the door. The Thrashers will end the 2007 calendar year in BAH-Stan to take on the Bruins for the second time in less than 48 hours. Fresh off Saturday night’s 5-0 beating, I’m sure the only thing the Bruins would dread more then face the Thrashers again is go for a drive with Ted Kennedy behind the wheel…thank you! “An entertaining statistical sidebar tonight. Barring a Thrashers shutout, which we don’t expect this evening, the next Bruin to score will score the 18,000th goal in Bruin’s history”. Needless to say, he broke all hockey protocol and jinxed his team! The Hockey Gods do frown on such things, you know. Hey Rob, the stat still stands! So what say you make the same comment later today prior to the game! Apparently the NESN TV broadcasters that do the Bruins games, Jack Edwards and Andy Brickley, do not think the Atlanta hockey fans “get it” when it comes to NHL hockey. Why, you ask? Well, because when we were giving the Bruins an old-fashioned beat-down in Philips the other night, we failed to sing that insipid “Na-na-na-na, Hey-hey-hay…Good-bye” song. Oh, of course! How silly of us! And, why…right here it is on page 102 of “America’s Single Standard for Hockey Orders and Lasting Etiquette”…the hockey fan’s official guide of behavior that was obviously written by Edwards and Brickley. From it I quote, “If the home team gains a point advantage that is seemingly insurmountable, the home crowd shall sing the ‘Na-na-na-na, hey-hey-hey, good-bye’ song in an attempt to taunt and shame the visiting team”. Well, there you go…needless to say a copy shall be distributed later this week at the next home game to all who attend. So, if the Thrasher do indeed provide us with a repeat of last Saturday night’s smacking of the Bruins…sometime around the middle of the third period, that’s the last period of an ice hockey game, (seeing that none of us down here know squat about hockey)…stand up, face the north-northeast and, at the top of your lungs, shout it out loud! “Na-na-na-na….Na-na-na-na…Hey-hey-hey…SHUT THE $%#@-UP….Jack and Andy! I’ll be traveling to sunny Florida on New Year’s Day, returning home Sunday…in time for the Buffalo game. I’ll be working on the mid-season report card for our team and should be able to check in periodically…depending on what brand of civilization I will be afforded, dial-up or hacking into an unlocked aerial signal, (oops, did I say that)? Anyway, I have a very special guest blogger lined up for you in my absence. My cousin Cletus from Alabama-stan has accepted my invitation and is anxiously awaiting his chance to provide his insight. I especially enjoyed the shots directed at the Bruins guys, and cousin Cletus. Good stuff! That's it for today. I look forward to seeing you at the game tonight or talking to you from the game tonight. Speaking of tonight- Be SAFE be SMART, don't be a DUMMY and DON'T drink and drive. If you ARE a dummy, I laugh at the thought of you ringing in '08 in the clinker. I SHUDDER at the thought of you driving and hurting yourself and others. So PLEASE, call a cab, walk, crawl, roll, I don't care, DON'T DRIVE if you've had a drink. As expensive as a cab can be, it's no where near the cost of a DUI, from the fine to a lawyer to finding alternate transportation for a whole year. And you can't put a price on LIFE either. 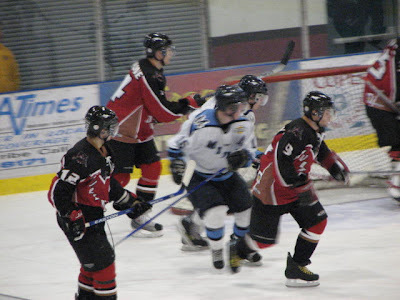 Timbermen win GOLD, pictures from the weekend. 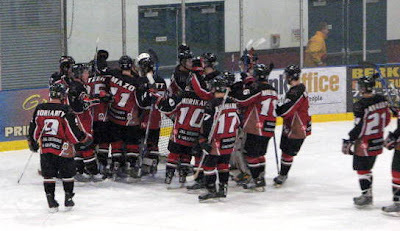 Congrats to the Alberni Valley Midget Timbermen, champs of the 2007 Alberni Valley Midget International Tournament, after a 4-1 win Sunday afternoon over the TriPort Eagles. For a while there it looked liked no one would score, but the Timbermen finally got on the board with an unassisted beauty by Colton Buffie with 2:02 left in the second. Troy Rata would make it 2-0 on the power play with 47 seconds left in the period for a 2-0 Timbermen lead after two periods. The Eagles made a game of it just short of the five minute mark of the third making it 2-1, but that would be as close as they would get. The T-Men lead would be 3-1 with an odd backhand flipper from neutral ice somehow finding it's way in off the stick off Kody Isherwood less than two minutes later. The game scoring was complete when Andrew Gaiga made it 4-1 with 7:23 to play. 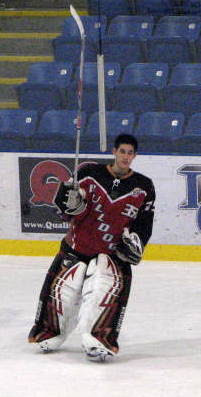 Edward Dyson picked up the win in net. Congrats to the Timbermen players and the team coaching staff- Alf Thompson, Barry Phillips, Mark Taylor and Jordan Newberry, along with manager Lisa Isherwood and trainers Dave and Jill Sherlock. Had to take this picture as the Dogs took to the ice wearing their WHITES on the road for the first time this season. 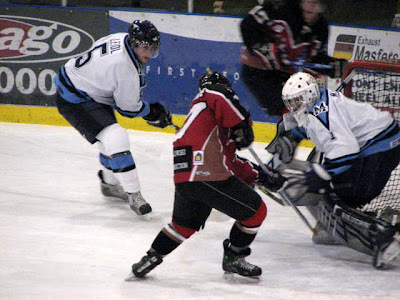 BCHL rules state that teams switch their jerseys post-Christmas break. Daniel Moriarty and Jordie Benn pose for a picture before the ceremonial puck drop Saturday night at the Bear Mountain Arena as the Swedish U17 team were the honored guests of the night. Of course the Dogs host the Caps tomorrow night. More on that tomorrow. The Bulldogs pulled out a gutsy 5-4 overtime win in Victoria tonight, tying the game with 7.7 seconds left after the Grizzlies scored twice to erase a 3-2 Bulldogs lead. The Dogs actually trailed 2-1 after two before coming out in the third and getting goals from Warren Muir and Evan Witt in a span of 1:20 early in the period. 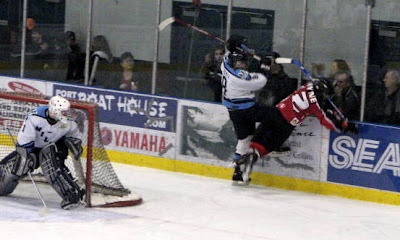 The tying goal was talked over by the officials before being allowed. Daniel Moriarty was the goal scorer. Moriarty would then be the hero 37 seconds into OT, scoring on a blast from the point with Justin Courtnall in the box for running into David Aime just as overtime began. 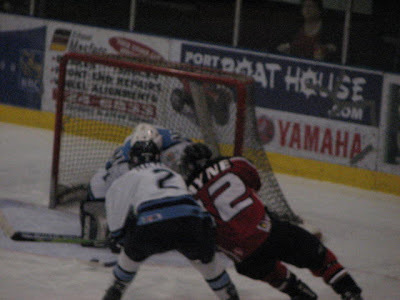 David Aime was stellar in goal earning his first BCHL win. 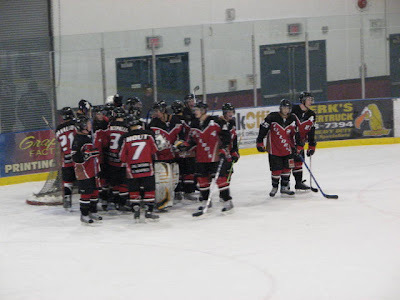 The Alberni Valley Timbermen were also winners tonight, beating Peninsula 4-2 to finish the round robin a perfect 4 and 0 to secure a spot in Sunday's 1pm Gold Medal game at their International Midget Tournament. I'll be there doing the rink announcing, I hope to see you there and I encourage you to get out and support the boys. 1pm, admission is free. 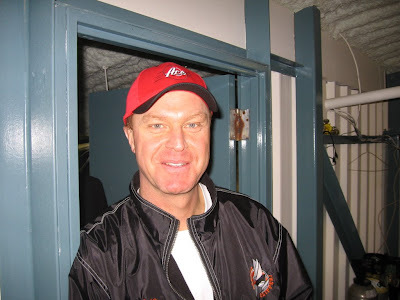 Tonight's second intermission feature guest is Dan Marshall, the play-by-play voice of the Nanaimo Clippers on our sister station 106.9 The Wolf in Nanaimo. The Dogs played better than 5-2 last night, but they lost the special teams battle and lost the "who gets the worst end of the awful calls" battle and in turn lost the game. It was an absolute pleasure to share the booth with my friend Bruce Sly from Nanaimo. Bruce, you did a great job for your first time, a great job PERIOD actually. Back to watching the World Juniors and getting ready to get on the bus and down to Victoria. I almost forgot. and PS- I NEED A LOGO. Wow, what a busy day... I almost forgot to pump up what is sure to be a big ratings hit tonight! 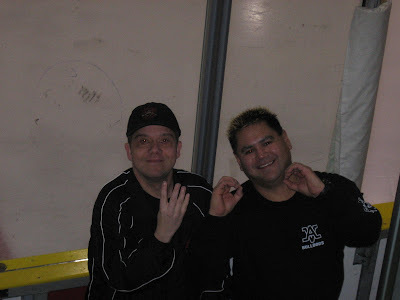 My friend Bruce Sly, AKA "the Canpar guy" will be my guest colour commentator tonight on the broadcast from Duncan. We've had this one set up for months. I know Bruce is fired up, as am I. It should be some good fun. Every since I got the word/permission in the late fall to use guests as colour commentators, I told Bruce that he would have to be my analyst one night. Bruce has a great love and knowledge of the BCHL, being the clock operator at the Frank Crane Arena for Nanaimo Clipper games. 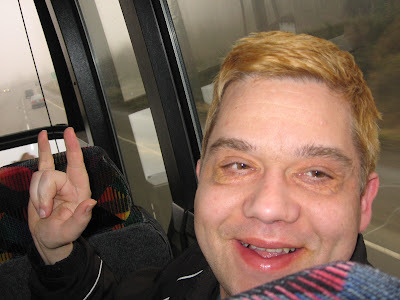 More importantly, he's well known and liked in Port Alberni and he has a great personality. Why is he well known here? With his great job with CANPAR Bruce gets to travel from Nanaimo to Port Alberni daily to deliver packages. With the amount of diehard Bulldog fans here he spends a good part of each day and each delivery talkin' hockey. That's why I say it's a great job, and I know Bruce agrees with me. If you are reading this Brucie, I won't say too much about your Wii Bowling Skills (or lack thereof) or how you admitted to being a closet Bulldog fan. They'd eat you alive in Nanaimo about that one! What makes tonight's involvement with Bruce special is that his daughter and wife hope to be able to tune in all the way from Italy. Very cool! If you have any questions for Bruce be sure to send them to the PRESSBOX via email. Calling all artists or photoshoppers with a PASSION for your work! An advanced warning- I don't have a lot to give, and I will be somewhat picky.. If I had a lot to give, I would've went to the professionals already. Back on topic- If this topic and thought interests you give me a shout via email and we can talk. I'm out, heading down to the dressing room now to get some game-day interviews for tonight. Click the above link for all the info you could possibly want about the Tourney. If you aren't heading down to Duncan tonight or Victoria tomorrow I encourage you to get down to the rink and support the boys and watch some great hockey. Admission is FREE and they will have plenty of draws and raffles going throughout the weekend. Last but not least, it should be some good hockey. 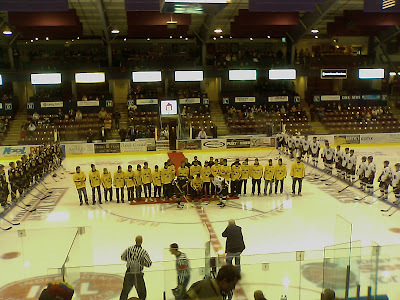 Teams have come from all over the Island, the Mainland, and even Calgary and California to take part. Incredible job on the website by Quinn Mulligan! So, what happened to Miikka Kiprusoff anyway? Money? Boy did the Flames sign him too quickly. It was nice to watch the Canucks forge on without Mattias Ohlund and Ryan Kesler. Also great to see Mason Raymond find the net. Not a bad season so far for the former Junior A player. Again, I said it yesterday about Kyle Turris and I'll remind you all again today in regards to Mason Raymond- Pay special attention as you never know who you are watching out there when you are watching a BCHL game, they could be the star of tomorrow. The Nucks next see action on Sunday afternoon as they host the Anaheim Ducks at 5:00pm. That means the pregame show on 93.3 The Peak FM (part of the Canucks Radio Network) kicks off at 4:30, with Tom and Shortie having the play-by-play just after 5:00. 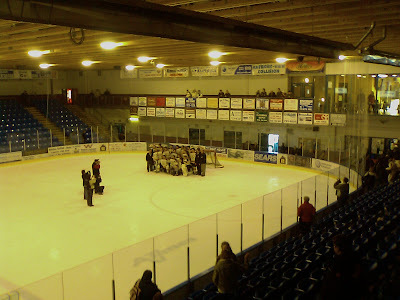 I was shocked yesterday to see on the A Channel News that Jackson Penny was out and Geoff Courtnall was in as the new Head Coach of the Victoria Grizzlies. When I looked at the situation a second time, obviously it wasn't too shocking, as Jackson Penny was thrown into the fire on the eve of training camp with Rick Lanz taking a job with the Colorado Avalance. Throw in the fact that Courtnall's son Justin plays with the Grizzlies and maybe this goes from a shocker to a no brainer. 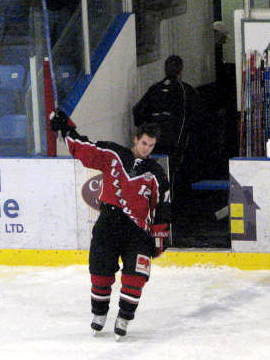 Courntall played once upon a time in the BCHL with the Cowichan Valley Capitals, so it's nice to see him "come home" so to speak, to the BCHL. Yet another example of what can come out of this league-17 years and over 1000 games in the NHL. From the way I view this situation, I don't think this move is happening because of the win-loss record of the team. Maybe it's just because of how they have played against the Bulldogs, but I've been impressed with the Grizzlies this year. For a team that lost two players as important as Jamie Benn and Garry Nunn, they have managed to stay in the hunt. 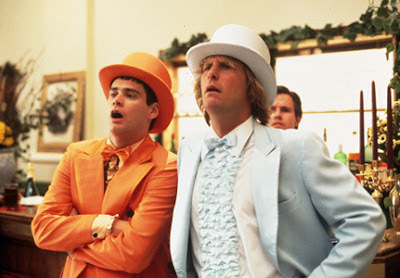 For what they had to deal with, I thought that Jackson Penny and Craig Didmon did a good job behind the bench. The Dogs are in Victoria tomorrow to take on the Grizz. I hope I can land an interview with the new coach. Sharie Epp, from the Times Colonist newspaper in Victoria has written a story on this that sheds some light on the decision Click HERE to read her story. Great stuff. Former BCHL'er Kyle Turris scored both goals this morning as Canada beat Slovakia 2-0 to start the World Juniors with two straight wins. Atta boy Kyle. One thing about Turris that I remember from the last couple of years when he was in the league is just how nice and polite he was. Whenever I'd be into hour two of a camp out at the Burnaby room to try and interview Rick Lanz, if Kyle was around he would always smile and say hello and make small talk and ask me why the heck I was still hanging out around their dressing room. Even on the Ferry, he would say hello and ask how it was going. 99% of the guys from other teams just ignore you or look grumpy. I have nothing against that, but it's nice to not be afraid of people either and not treat them like "the enemy" so to speak. So thanks for that Kyle, and enjoy the show next year as there is NO WAY you are spending another year at the NCAA level, in my humble opinion. 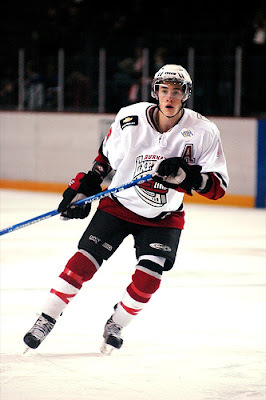 The success of Turris should make BCHL fans realize that you just never know who you are watching out there on the ice. They could be the star of tomorrow. It was nice to see that the TSN.ca broadband broadcast WORKED this year as opposed to last year, so I could watch the game this morning between on air moments. If you don't have the benefit of a TV or a computer capable of watching the games at work, try listening to it through the Internet broadcast from THE FAN590 out of Toronto. Thanks to everyone that came over to our house for the second annual "Kick off to the World Juniors" brunch on Boxing Day. My apologies to anyone who I didn't invite. We just don't have enough room for a big crowd. It was a fun morning and a good game. Thanks to Brent Paul from Double R Meats for the great breakfast meats. Also thanks to Brent for tracking down some friends in the Czech Republic to try and get me a puck from this year's World Juniors. That would make three tournies in a row if I could get one, which would be cool for my puck collection. Lastly, thanks to David Wiwchar from A Channel for showing up and getting us on TV. Very cool. I hope everyone had a good Christmas, or whatever you celebrate. The Dogs were back at work with practice yesterday, in preparation for three games over the next couple of days- Friday in Duncan, Saturday in Victoria, and then Monday night for the New Year's Eve game against the Caps at the Pound. More on the Dogs tomorrow. Rudolph was suing over unauthorized use of his nose. Looking for late Christmas presents? 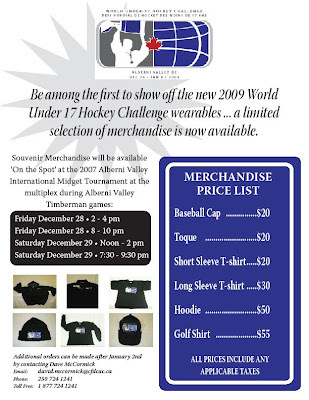 Don't forget, the 2007 Alberni Valley International Midget Tournament kicks off Friday! I'm out. Whatever you celebrate, have a great time with your family and friends! Almost time for the BIG DAY kids. Here at the radio station this morning as I was reading the 5 day forecast and realizing that the 25th is the 5th day of it! That's when it hit me how close the big day is! 3 more days until I start shopping! Just kidding. I'm done already. A record time for me! Here's the "video of the day" for this fine Friday. Hilarious! Thanks to my good friend Eddie Gregory, the Play-by-Play Voice of the Burnaby Express and The Team 1040, for giving me the heads up. Great stuff! 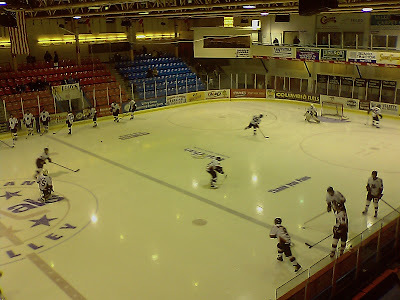 I can't believe that there are FOUR games in the BCHL tonight. I guess I didn't notice how good our break was until I look at some other teams. Ouch. Get home safe everyone. Speaking of getting home safe, I got this nice email from the Hout family, and I got their permission to post it here. 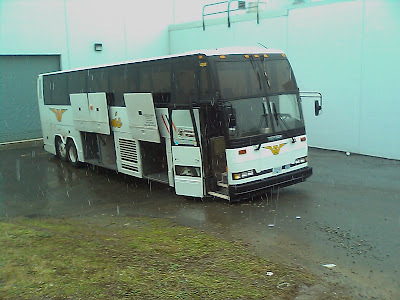 Nice to hear the guys are home and having fun, and it's also nice to hear that they are having fun in Port Alberni. Don't forget that these "kids" are for the most part pretty far away from their families, and those closest to them! All I can say is this- when it comes to supporting them, and those that base that on just wins and losses, please know that they sacrifice plenty to earn the right to wear the sweater. I know most people realize this, and most people just want an honest effort! Merry Christmas fellas, and to all of your families too! Makes me further realize the importance of billet families. Not just to the players, but to their parents!! This is my last article before I head off to Abashiri next week. It’s been seven long years since I was in my second home, and words cannot express my excitement! 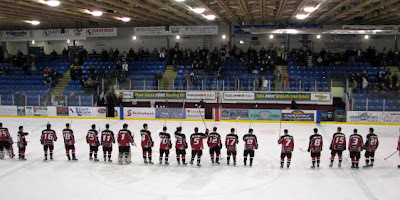 Part of my visit will be official as the Port Alberni Fan Club is hosting a “Port Alberni Night,” and I’ll be meeting Mayor Oba on Christmas Day. I’ve been told that my visit is generating a lot of excitement, and I hope to bring that feeling home with me. I’ll be away until January, 2nd, and will then continue the preparations for the arrival of the Abashiri Northstars. November was a very busy month for us as we met students and parents interested in the July 2008 trip, and finalized the details of the Hockey Delegation. I’m happy to say that we had no problem finding homestays for the team and the Bulldog’s Coach and Multiplex Parks and Recreation managers were very excited to be a part of this community event. A big thank you to Coach Kerr, Ron Paulson, and Ron Doeztel!! On Friday, January 11th, the Abashiri Northstars will visit schools in School District 70. Then from 12-2 pm, Bulldogs’ Coach Alan Kerr, and some of the Bulldogs will coach the team. Following that session, the Northstars will watch a Bulldogs’ practice. Saturday, January 12th, is “Abashiri Day” at Neill School and we will have numerous cultural events including the Uminari Taiko Drummers from Victoria, Martial Arts demonstrations by local experts, and a song performance by the Abashiri Northstars. There will be origami, Japanese calligraphy and many more cultural activities. Tickets for this event are available at the Rollin Art Centre and Echo Centre. Admission is $5 for children, $7 for adults and $15 for families. This is bound to be a memorable event, and we hope to see many of you there! In addition to all that fun, we’re also hoping to have the Abashiri Northstars play a Port Alberni Atom team at the Intermission of the Bulldogs’game. This is the first overseas trip for these little guys, so we hope “The Barn” will give our little friends a warm Port Alberni Welcome. Very cool, as I said. Good on the Bulldogs to be involved. I know that THE BARN will indeed give a great Port Alberni welcome to our friends! 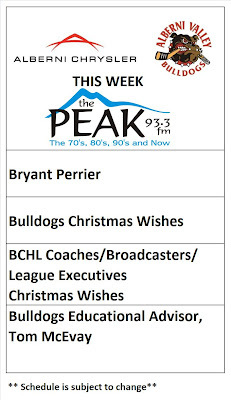 No Bulldogs games means no Bulldogs Broadcasts on the Peak this weekend. BUT as 93.3 The Peak FM is part of the Canucks Radio Network, you can catch The TEAM 1040's John Shorthouse and Tom Larscheid with the pre game show, all the play-by-play, and the post game show. We got it all! the Nucks are in Phoenix tomorrow (quick, how many people knew that Gretz has the Coyotes at ONE GAME over .500 this far into the season) Catch the pregame at 6:30 and the puck drop and all the play by play after 7:00pm. The game is on CBC as well, the back half of the double header. Sunday, the Canucks visit the Avs. Pregame at 4:30. Tom and Shortie again the play-by-play just after 5pm. Sportsnet Pacific has the TV broadcast for you. One last warm and fuzzy before I'm OUTTA HERE today. This one came up on my "Weird News File" for the morning show today. Kinda reminds me of Lloyd Christmas and Mary Swanson on Dumb and Dumber. That's it for me, I'm OUT. I might be checking out until Boxing Day too, and the start of the World Juniors. Maybe even until the Dogs are back in action on the 28th. I don't really know when, and THATS GREAT!! Merry Christmas, Happy Holidays, to one and all! ...Sorry because you might not like this posting much, because you are often on the losing end of it. Don't bother bringing up Halifax or wherever it was....It never happened. It's all been permanently erased from my memory, like any fleeting belief that Marc Andre Fleury had potential to be a good goalie. If anything, the US being on the "losing end of it" is a testament to the US Hockey model, being that they are such rivals for Canada now. It used to be Russia or no one. Tell me fans, quick, who did Canada beat for the GOLD last year? I have no clue. But I remember the semi win over the US vividly. Maybe it was the situation though, as I was stuck at the station doing my show, with the entire station staff in the control room listening to the Internet broadcast (no TV here) hanging on every word of overtime and the shootout. Yes, it's less than a week until the World Juniors! Which means I am FIRED UP already. It's my favorite time of the year to watch hockey. Tied with the NHL playoffs at least. If the tourney is in Canada, then it's World Juniors, because the fans in Canada are so passionate. 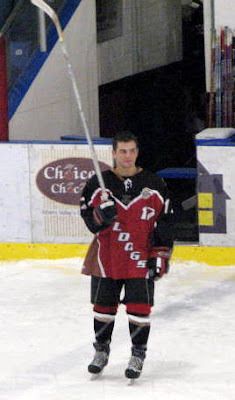 A final word regarding USA Hockey- Just look at the BCHL or the WHL or the Bulldogs roster and you can see the talent coming from south of the border- Adam Hout, Mark Morikawa, Evan Witt, Josh Pineiro, Lee Pazter. Now, some videos! I love this one, not just because it's without Gord Miller and Pierre Maguire, but because it's from the FAN perspective. All the way in Sweden, and Canadian fans run the show. I like this one because of the Canadian crowd. And the PHYSICAL PLAY. And this one because it was the biggest of them. And to hopefully make people realize BOB COLE isn't bad when it's a RED Maple Leaf, and not a blue and white one. It will be a nice early Christmas present from someone, as the Bulldogs are releasing some season tickets in an effort to cut down the number of people on their season ticket waiting-list. Here's the gist of the email I got from the team office. We have released 150 seats for the season ticket wait list. Anyone interested can come to the office Thursday, Friday and Saturday from noon till 5pm. If they purchase the remaining season, 12 games , they will receive season tickets prices and will then be on the season ticket list for the next year. 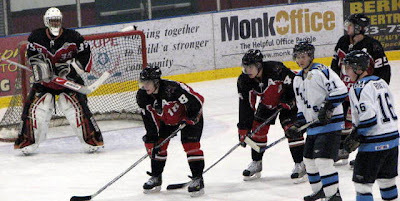 Don't forget the next Dogs home game, the New Year Eve Game, as the Cowichan Valley Capitals are in town. The game night sponsor is Alberni Chrysler. The first 900 fans get cheer sticks. Anyone 21 and older will be eligible for a draw for a trip for two to LAS VEGAS. Feel free to take me! TORONTO - Chris Simon has received the longest suspension in NHL history - again. The New York Islanders forward was banned 30 games by league disciplinarian Colin Campbell after Simon stepped on Pittsburgh's Jarkko Ruutu during a game over the weekend. Simon missed the first five games of this season while completing a 25-game ban handed out in March. 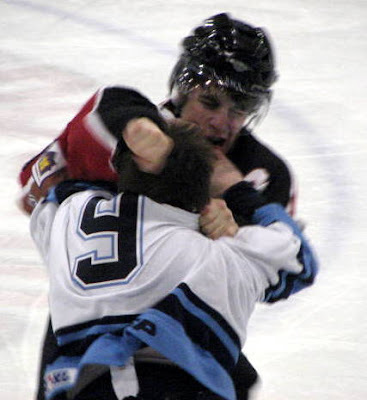 That was the previous record for an NHL suspension. This is the seventh time in Simon's career that he has been suspended. The 35-year-old left the Islanders earlier this week to receive counselling. Yes, I'm staying away from hockey again for a bit. Don't worry, plenty of hockey stuff tomorrow and the next couple of days before the blog winds down a bit for Christmas. I was proud to attend the reception for Canadian Olympian Travis Cross tonight at the Alberni Valley Multiplex Upper Lounge. I don't know how it still surprises me, since it's just typical Port Alberni support, but it was standing room only with over 200 friends/family/coaches/supporters/sponsors etc showing up to recognize Travis. And here is the video from tonight. Merry Christmas from the entire BCHL! + HELLO....Italia? Click the link below and enjoy the Christmas Wishlists and Holiday Greetings of every Coach/GM/Play-by-Play Broadcaster from all corners of the BCHL, and even words from the BCHL executive. Enjoy! All audio is courtesy and copyright 93.3 The Peak FM, and the Jim Pattison Broadcast Group. To whomever was posting comments from Italy- Thanks a bunch for visiting the blog! I removed your comments as I wasn't sure if it was material I would want on here, as I don't speak Italian. I have nothing but respect for the hockey in Italy. 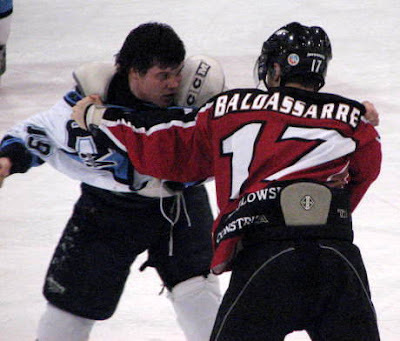 Former Bulldog Mike Distefano even went to play for the Milan Vipers a couple of years back.....Which makes me wonder, does anyone know where Mike is at now? Drop me a line HERE or post a comment if you know! I'm sure I'll forget some- But the Dogs have had a good amount of Italian talent in their line up over the years. Sorry if I have anyone wrong. If I have missed anyone, please add to the list! After the show tonight, I will be submitting a copy of the Bulldogs Christmas Wishes/Greetings for their consideration for their multimedia site. 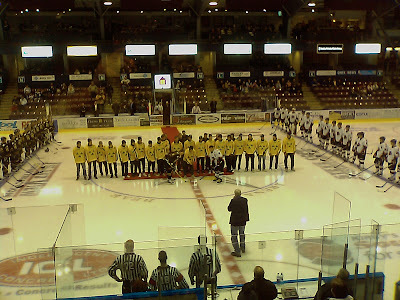 I will also be posting a link to the BCHL version of the Wishes and Greetings here on the blog. So be sure to check back! Here is the link to the interview I did Saturday afternoon with Port Alberni Wrestler Travis Cross, just after he booked his ticket to Beijing and the 2008 Olympic games after he won the Canadian National Wrestling Trials in Etobicoke, Ontario. There will be a congratulatory reception for Travis Tuesday night, 7:30, in the upper lounge of the Alberni Valley Multiplex. It's open to anyone and everyone that would like to offer Travis congratulations for making his dream come true! I hope to see you there. Thanks again for checking the blog! TRAVIS CROSS IS GOING TO THE 2008 OLYMPICS!!!!!! I got a call from a jubilant Tom McEvay this afternoon, and I could tell by the tone in his voice the second I heard it that it was good news. " He did it, we're going to the Olympics!!!!!" was the next words out of his mouth. This is just incredible. Small town Port Alberni. Wrestling for Canada at the 2008 Olympic games in Beijing. There's no update yet on http://www.wrestling.ca/but trust me, this is the REAL DEAL. Congrats Travis and family. Congrats to his Coaches James and Ivan, and to Tom McEvay and everyone with the Alberni Wrestling Club. And everyone that supported Travis. And everyone in Port Alberni period. When something so big comes out of a place so small, you know that everyone has some part somehow in making it all happen. I can't imagine how it feels for Travis and his supporters, given that I'm on cloud 9 myself! I caught up with Travis live via phone in Etobicoke today to get his reaction and his thoughts. He was excited, he was emotional, his phone was ringing off the hook. Click the link below to listen to the interview that ran live this afternoon on 93.3 The Peak FM. Congrats to Travis and everyone involved! a Holiday greeting from everyone. So be sure to tune in tonight to find out what the Bulldogs players/coaches/staff/management want for Christmas, and their holiday greeting to the fans/billets/parents, etc. 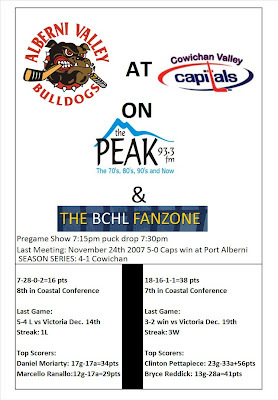 I had initially come up with this idea as a way to fill time on "Bulldogs This Week" this Monday night at Alberni Chrysler, as I knew I wouldn't have a player coming up on the show as they will all be gone for the Christmas break. I will still be running the feature Monday night for everyone that will be at the game tonight or won't be able to tune in. I decided to air this tonight as a nice way to send the players and staff back to their families and friends, and to have a little fun in the process. Don't miss it tonight, I'm sure you'll enjoy it. 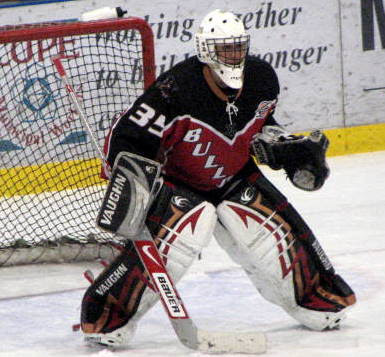 Tonight's second intermission feature guest is a special one, as I managed to catch up with Perry Elderbroom, the Bulldogs Goalie Coach and President/Director of Operations for GOLD IN THE NET to find out what Perry does with Harrison May and David Aime, and what the position of goalie is all about. Some people have been adding comments about how the players need to work on the home ice "Salute to the Fans" after a victory, in light of Wednesday night. I'm sure the players do need to work on it. They just need to win more, plain and simple. It was the first salute for a lot of guys out there. 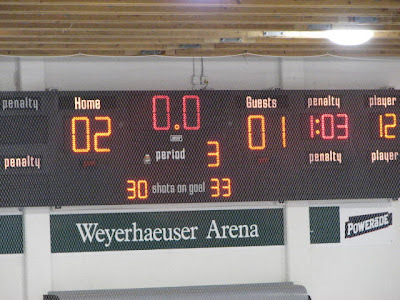 Quickly- When was the last time the Dogs won on home ice? I bet you don't know! That right there shows that the players need to be cut some slack about the lack of synchronization of the salute. The way the guys are working right now, we'll see more of them! 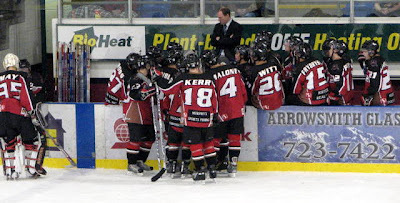 To answer the question- When was the last time the team won at home- October 20th, 5-3 over the Salmon Arm Silverbacks. Tonight, they go for their second win in a row, and their second two game winning streak of the season. The last two game winning streak for the team? 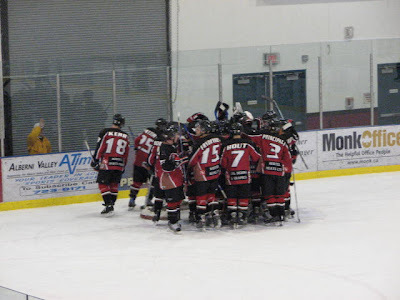 October 18th, 5-4 in 2OT over the Nanaimo Clippers, and October 20th, 5-3 over the Salmon Arm Silverbacks. 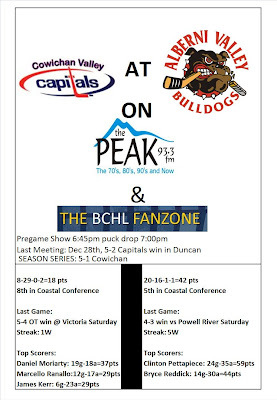 It's a ways off still, but the Dogs have a big night planned for the New Year's Eve game when the Cowichan Valley Capitals come to town. Here's the details of the plan, from the Dogs office. 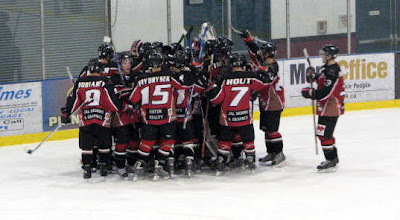 Alberni Chrysler is our game day sponsor for the New Years Eve game this year. We will be handing out cheer sticks to the first 900 people entering the door. Anyone that is 21 years or older will have a chance to win a trip for 2 to Las Vegas, including air fare and accommodations for 3 days and 2 nights. I wonder if I can win? Sounds like it should be a fun night! Hi everyone. I just wanted to let you know my Olympic trials are this Saturday in Etobicoke, Ont. I am seated number one having won the Nationals in March. On Friday and Sat. morning other wrestlers in my weight will be competing in a ladder draw. The winner of the match between the 2nd and 3rd seed wrestlers on Saturday morning will then wrestle me in a best 2 out of 3 matches. 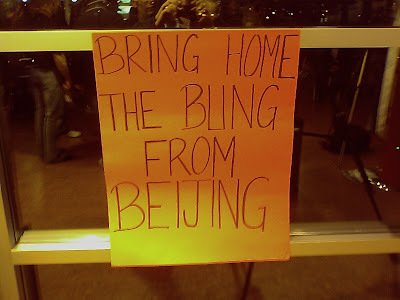 The winner will represent Canada in the 2008 Beijing Olympics! I love it when I get caught supporting someone....Funny story- Last year Travis came into the station to do an interview on the Morning show to talk about his efforts in getting to the Olympics. When he came in, he brought me a "Travis Cross in Beijing 2008" golf shirt. Just a couple of weeks ago I went in to talk with Rob and Dean and the gang at JAL Designs. While I'm there, in walks Travis. I quickly stripped off the jacket to flaunt my Travis Cross shirt I had on, ha ha! 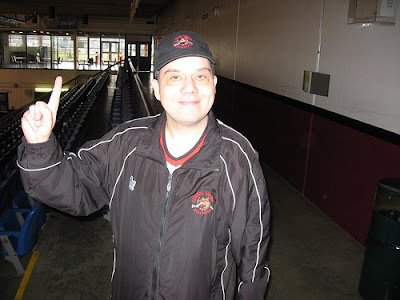 I almost forgot this one- Got this nice email from my good buddy Bruce Sly, game night clock operator for the Nanaimo Clippers and the un-official ambassador of all things Clippers in Port Alberni. Congrats go out tonight to Pat and Nicole Siedlecki on the birth of their first son Nicholas (spelling?). Bandits, Bulldogs, Clippers now Hurricanes. Good news I wanted to pass on to your audience. Thanks a bunch for the note Bruce, I certainly appreciate it and I know Bulldog and Clipper fans will be happy to hear this too. Congrats on the new addition you two! 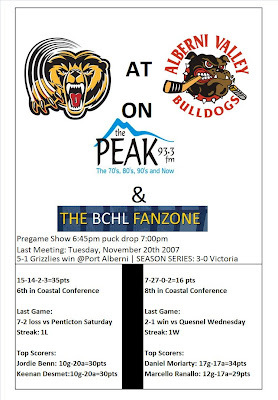 Alberni Chrysler's presentation of "Bulldogs This Week" Monday night on 93.3 The Peak FM and live at the dealership will be a special one. Bryant Perrier will lead off the show joining us by phone to recap the last couple of games this week and look forward to the team returning from the break. Following Bryant, I will run the Bulldogs "Christmas Wish List/Holiday Greeting" special. "what would you have on your wishlist for your team to find under the tree on Christmas morning"
For those that can't catch the show Monday, I will put a copy of that up here on the blog Monday night. Big thanks goes out to all of the people and personalities in this league. Catching up with everyone over a couple of days, it made me proud to be a small part of this league and this group of people, because they are all GREAT people. Thanks for the time everyone! To wrap up the show, my guest will be Tom McEvay, the Bulldogs Educational Advisor. We will go in depth about what Tom does, what the Bulldogs organization does, what the players do and what the league does to get these great kids and great players scholarships to further their career at their education at the NCAA or CIS level. Before I go, I just want to pass along my humble thanks to everyone that has passed along such good feedback about the JAMIE AMOS show on SHAW. Amos, you did a great job bro! 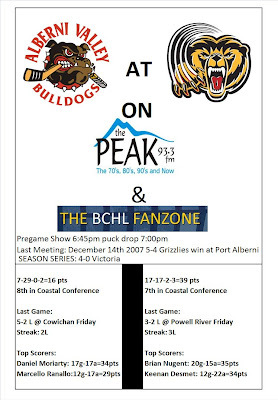 Don't forget to tune in to SHAW Channel 4 in Port Alberni for "The Daily" and the feature on Jamie's 300th Bulldog game. I think that's about it for today. WHEW. Thanks as always for reading, if you can even keep up with me! The JAMIE AMOS SHOW, on SHAW TONIGHT! He isn't just A beauty. He is THE beauty. Bulldogs Assistant Equipment Manager Jamie Amos just worked his 300th Bulldogs game last night, as they defeated the Quesnel Millionaires by a score of 2 to 1. He has worked over 400 Junior games now, as he passed that milestone last year in Langley when he traveled with the team and then trainer Preston Charles on a Mainland road swing. 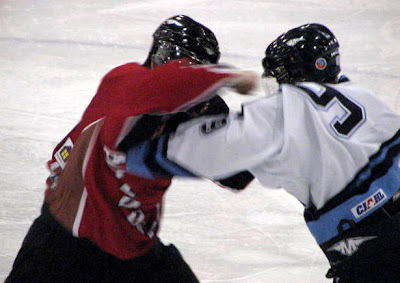 He first got involved with the Junior hockey level with the Junior B. 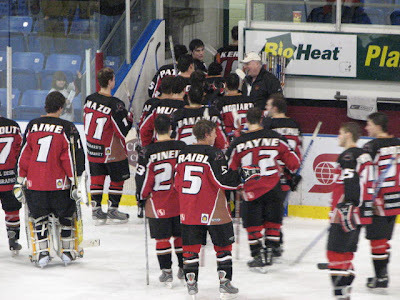 Port Alberni Bandits before the Bulldogs came to town for the 02-03 season. To honor the occasion, I have devoted this week's "Bulldogs on SHAW" show to Jamie. Tune in to SHAW CHANNEL 4 to see the show, where I caught up with Jamie and interviewed him and asked him such things as how he got involved with the team, what his duties are, and who his favorite all-time Bulldog is. After speaking with Jamie I talked to Bulldog Trainer Jessie Moser to find out what working with Jamie is like. Lastly, we spoke with Bulldog Goaltender Harrison May to tell us what Jamie means from the players perspective. Huge thanks goes out to Jenny Fortin at SHAW Port Alberni for her efforts and professionalism in putting the show together through the shooting and editing of the final cut. You are a true pro Jenny! Also thanks to Darren Evans and Nancy Wilmont for all that they do in making these shows happen. We are hard at work trying to get everything done right now so it's ready to air in it's final form. The show should first hit the airwaves tonight at 6pm, and it will run for the next while at least once and hour. I've been told that they also air these segments on the SHAW Community Channel in Nanaimo, so for all the readers from the hubcity, be sure to tune in. Jamie is a great guy and a great friend and it was a pleasure to do this show! 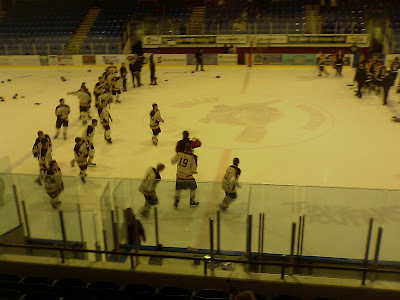 Bulldogs 2 Millionaires 1, fanzone problems? Well done gents. It wasn't easy, but it's never easy, right? One thing is certain- If this team has the courage and guts and strength to bring it every night like they have brought it the last three games, they will be without a doubt the most hated team to play in the entire league. They have worked incredibly hard, they have been punishingly PHYSICAL, they have been FIRED UP. An incredibly hard team to play against. The players have created a problem for themselves. They have shown us what they can do, fans, coaches, broadcasters. They have shown that they have the heart, that they have the drive, that they have the work ethic. Now they need to show us again, now they need to show us all the time. With the rewards they received at the end of the game last night- WINNING- I hope they have found their desired reward and their desired motivation. Congrats to Jamie Amos on his 300th game. Nice to hear that former Bulldog trainer Matt Auerbach called him to catch up and to congratulate him. Way to go Jamie! Be sure to check out the BULLDOG SHOW on Shaw, starting Friday night and running throughout the weekend, for my latest show, all about Jamie. In the future, please send me an email as soon as their is a problem. I can't always solve the problem, but I will certainly try. It's good to know that something is wrong....Two games later is waiting way to long! But better than not finding out at all! Thanks to Judy Bailey for the great pics below that she sent me after the game last night!